Durian Vs. Jackfruit: Are They The Same or Different? The jackfruit tree falls in the mulberry and fig family (Moraceae). The fruit includes hundreds to thousands of individual flowers. It has sweet, fleshy orange-yellow color petals that are edible. Durian resembles jackfruit in appearance, but they are not related. Like jackfruit, durian is fragrant and flavorful. 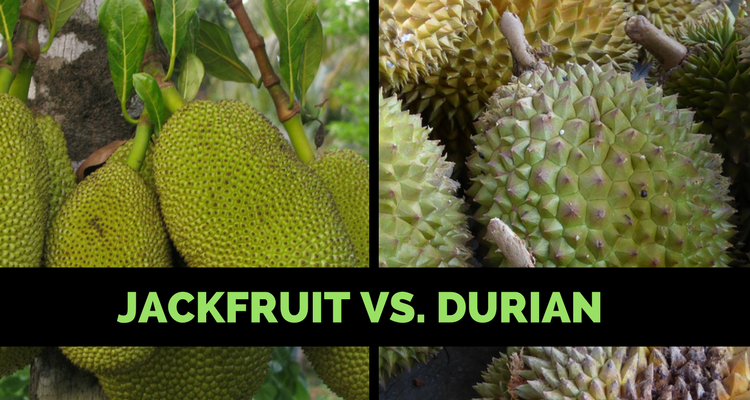 Here, we’ve compared the two fruits, jackfruit vs. durian, in terms of the nutritional value and health benefits they offer. Let’s first take a look at the jackfruit vs. durian nutrition facts. Jackfruit is a good source of dietary fiber, minerals, and vitamins. Durian is also rich in these nutrients. Jackfruit has a good amount of dietary fiber. A 100 gram serving of jackfruit contains 94 calories and 24 grams of carbohydrates that consist of two grams of dietary fiber. Durian contains more calories than jackfruit per serving. A 100 gram serving of durian contains 147 calories. The carbohydrate content in durian is 27 grams. It comprises of four grams of dietary fiber which is greater than that of jackfruit. Jackfruit contains trace amounts of fat that mainly include omega-3 and omega-6 fatty acids, whereas durian contains five grams per a 100-gram serving size. Jackfruit is a good source of vitamins A, C, and B6. It provides six percent, 11%, and five percent of the recommended daily intake respectively. It also contains thiamin, riboflavin, niacin, and folate. The flesh of the fruit contains simple sugars like fructose. These sugars provide instant energy. Vitamin C provides resistance against infections and combats harmful free radicals. Jackfruit contains nine percent RDA of potassium. Potassium helps maintain blood pressure and heart rate. In this Jackfruit vs. Durian comparison of vitamin C, Durian leads by 33%. The amount of thiamin, riboflavin, niacin, vitamin B6, and folate present in durian is 25%, 12%, five percent, 16%, and nine percent respectively. The potassium and manganese contents in durian are more than those of jackfruit. On the other hand, jackfruit contains more vitamin A, calcium, and magnesium. A study published in The American Journal of Gastroenterology states that protein from meat and fish may increase the risk of irritable bowel syndrome. Not many fruits contain proteins. Durian and jackfruit both provide three percent of the recommended daily intake of proteins, so they are a good alternative to meat. You can eat them along with some vegetables or whole grains as a side dish to increase the quantity and type of protein intake. Jackfruit vs. Durian: Which Is Healthier? Now we will compare jackfruit vs. durian benefits on health. Jackfruit has various medicinal uses. It has antimicrobial, anti-inflammatory, antifungal, and anticancer properties. Jackfruit is good for diabetics if consumed in moderation. A study conducted by Sydney University Glycemic Index Research Service showed that jackfruit has a glycemic load (GL) of 17, and that it may even reverse diabetes. The glycemic load of jackfruit is almost half of that of rice. A serving size of 30 grams of jackfruit easily replaces a cup of cooked rice. Eating jackfruit may help reduce weight. It reduces the calorie content per meal by half compared to rice. It helps keep you satiated for a longer period, and thus, prevents cravings. Vitamin A in jackfruit helps maintain the integrity of mucosa and skin. So, vitamin A fights wrinkles, and gives a flawless skin and glowing complexion. Also, jackfruit seeds are beneficial for hair growth and aid in the digestion process; they act as a good laxative. Durian also benefits digestive health. It reduces constipation, bloating, and blockage in the intestines. Durian has insoluble fiber, which aids digestion and helps normalize the release of insulin. Potassium is present in durian in decent amounts. It reduces the chances of heart attacks and strokes. Potassium also reduces stress on the cardiovascular system. Durian, like jackfruit, is beneficial for skin health. It reduces wrinkles, age spots, and other signs of premature aging. It contains high amounts of the amino acid, tryptophan. This amino acid is essential for a sound sleep, to reduce headaches, and soothe nervous irritability. Durian is also a good laxative like jackfruit. And, it may decrease the risk of cancer. Durian fruit is good for bone health and may prevent the development of osteoporosis. According to a study published in the International Journal of Food Sciences and Nutrition, durian fruit is rich in antioxidants in the form of flavonoids, polyphenols, caffeic acid, and anthocyanins. The antioxidants in a durian destroy free radicals present in the body. Finally, let’s take a look at the differences of jackfruit vs. durian taste. Jackfruit and durian taste completely different. Durian has a distinctive smell. Many describe the smell as stinky and intense. Jackfruit has a sweet and fruity aroma, although strong. The smell is similar to a combination of pineapple and banana. The taste of both these fruits varies according to their state of ripeness. The flesh of jackfruit is rubbery, chewy, and very pliable. It can be compared to a cross between a mango and a pineapple; however, some people feel jackfruit tastes more like pulled pork. Durian tastes like a creamy pudding enclosed in a thin, waxy skin. Although durian is a fruit, it doesn’t taste like one. Durian isn’t tangy or juicy. It has a creamy consistency is savory and sweet. The taste of durian is unlike any food in the Western world. Some feel it tastes like diced garlic and caramel poured into whipped cream. If durians are harvested when they are unripe, they may have no flavor at all. Sometimes, they may even taste like metallic scrambled eggs. After this jackfruit vs. durian comparison, we can conclude that both fruits differ entirely in taste and texture. To reap all the benefits of jackfruit, you can have it raw or use it in a curry. Jackfruit can be an ingredient in chips, jellies, wine, and leather. Durian can be a great addition to ice creams, milkshakes, and cappuccino. It is used to flavor sweets such as Malay candy, ice kachang, dodol, and biscuits. In conclusion to this jackfruit vs. durian comparison, we can say that both fruits provide adequate nutrients and health benefits in their own way. You can have both of these fruits in moderation as they do have sugars in them. “Durian fruit nutrition facts,” Nutrition-and-you; http://www.nutrition-and-you.com/durian-fruit.html, last accessed April 6, 2017. “Jackfruit nutrition facts,” Nutrition-and-you; http://www.nutrition-and-you.com/jackfruit.html, last accessed April 6, 2017.